Opalescence Melon flavor syringes is the first ADA accepted, syringe delivered, take-home bleaching gel. The patented formula has sticky, adhesive properties, which produce results in days rather than weeks. 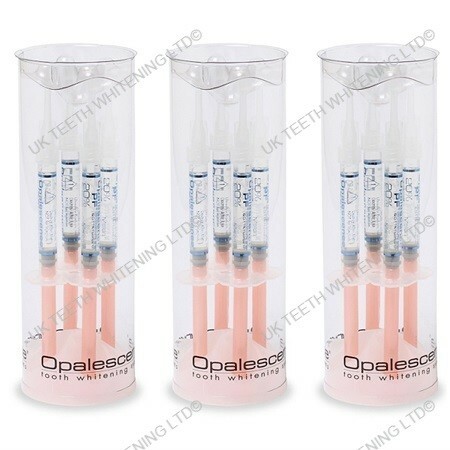 Opalescence® tooth whitening system safely bleaches your teeth to lighten discoloration caused by food, coffee, tobacco, aging and other sources. The active ingredient in Opalescence, carbamide peroxide, has been recognized by FDA for many years as an oral antiseptic and is now used for its superior tooth whitening properties. Opalescence is available in a variety of carbamide peroxide concentrations to whiten even the most difficult stains.